Thursday night: Finish my synopsis! Friday night: Get to 10,000 words on my WIP! Thursday night: stared blankly at synopsis, closed it down, watched The Vampire Diaries instead. Friday night: OK. What I did Friday night will be described below. But it was not writing. I DID write about 300 words on my synopsis Friday afternoon though, so it wasn't a complete failure. 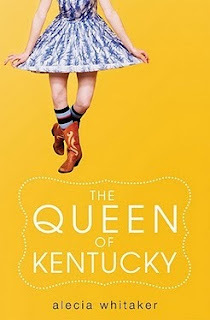 SO anyway- the point of the post- On Friday, I attended a session called The Real Queen of Kentucky, led by the author of The Queen of Kentucky, Alecia Whitaker. Alright. Before I even went to this, I already thought Alecia Whitaker was fantastic. I mean, she's from Kentucky so that's like....8,000 cool points right there. (That's right. 8,000.) And THEN, she wrote a YA contemporary set in rural Kentucky that shows that KY kids are just NORMAL, KIDS--who wear shoes, speak English, and have all their teeth. (I get so annoyed with this whole Kentucky hillbilly image that is portrayed everywhere.) Plus the cover is friggin gorgeous. Look! Anyway- Alecia did a quick reading from her book--just a few sections to give us a little intro to the characters--and that did it. I LOVE HER. She was fantastic. The personality she brought to the reading was outstanding, and totally made me fall in love with the main character right away. I think reading aloud from your own book has to be hard. Alecia rocked it. *sigh* Don't you love it? Don't you want to read it? Alecia: Do I know you? Me: I'm Megan. We talk on Twitter. Alecia: MEGAN! *hugs* I knew you looked familiar! I bet you were like, Why is she staring at me? Me: Well, I'm just so pretty. WHY ON EARTH DO I SAY THINGS LIKE THAT??? Alecia: You GLAMOURED me! I couldn't think straight! BUT SEE? SHE TOTALLY DIDN'T MIND THAT I SAY STUPID THINGS! And then that night, I DM-ed her and said, "Uh, is it weird to ask if you have plans for dinner?" To which she responded, "I was just looking up movie times to see if you wanted to go to one." See? We're in love, people. Ok not really. But isn't she the nicest person?? I mean, how many authors are gonna be like- "Sure, random Twitter follower who obviously has a ridiculously huge ego, I'll hang out with you. Alone. In your car." ??? She ROCKS! We went to see Mirror, Mirror (meh) and ate Fazolis (yay!) at 10:00pm. And we talked agents and authors and queries and outlines and it was all kinds of fabulous. It was also a nice reminder that authors are just people. I mean, I know that. It's not like I thought Alecia Whitaker walked on water or anything. (Seriously. I didn't.) But, you know, I've met authors in the past who were....less than approachable. And were a little like, "I'm an AUTHOR. You are a FAN. We are on DIFFERENT LEVELS." Ok. I'm wrapping this insanely long post up with a quick note- Go follow Alecia on Twitter (@aleciawhitaker). Go buy her book (I'd link to Amazon, but I've decided that it hurts my soul to do that.) Go check out her web site (www.aleciawhitaker.com). And if you ever get a chance to meet her, say hi. You'll love her. Then come tell me about it so we can gush about her fabulousness. I think that's the best part- that she had teens do the book trailer. And it turned out so good! Such a great idea. That is ALL CAPS AWESOME!!! I know!! Let's remember to be those awesome when we're published.